Soak raisins in warm water for 5 minutes. Drain. 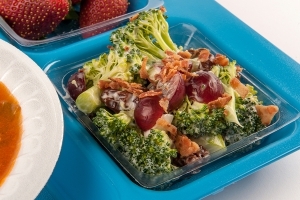 Combine grape halves, raisins, broccoli, and sliced green onions together in bowl. Mix mayonnaise and vinegar. Pour over broccoli mixture. Sprinkle with cooked bacon crumbles. Serve immediately or cover and place in refrigerator until ready for service. Portion with a #6 scoop (2/3 cup serving) per serving. Each portion provides ½ cup dark green vegetable and ¼ cup fruit. Salad may be portioned into individual containers before service.